Your girlfriend looks beautiful and instead of telling her at dinner – you text her later how beautiful she looked. If your lucky your girlfriend might just think you are sweet or she may think: “Why didn’t he man-up and say it when we were out?” Girls also do it and text things that would have been better said face to face. 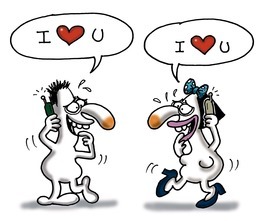 Of course texting is convenient and less confronting, however, in relationships we still have to put ourselves in the ‘unknown and uncomfortable zone’ and this will bring cherished rewards. When you tell your girlfriend she looks amazing it is important to see her smile and this will help you understand she loved this and you will do it again and again. Both people, in the exchange of pleasantness, need the exchange to be real sometimes to really benefit fully and emotionally for the times to come. Texting can always re-confirm what was said and that can be extra sweet because the sweet memories come rushing back for both parties as they visualise the real event. If people hide behind texting because they have something they are not telling the other people in the relationship, the real outcome will not take long to reveal itself. So, let’s remember texting is a good way to say: “I will be home in 10 minutes” or “could you pick up Kate from soccer”, but when you want to praise someone or tell them something wonderful – don’t waste it just in a text.